Last week, the Supreme Court of Canada handed down a unanimous ruling in the Carter v. Canada (Attorney General) case. The Court struck down Canada’s ban on assisted suicide as unconstitutional, as it deemed the law unreasonably restricted the right to life, liberty and security of the person protected by s. 7 of the Canadian Charter of Rights and Freedoms. On reading the news, my emotions ran the gamut from shock and outrage to sadness and worry. My concern? That this ruling finds us at the top of a slippery slope leading to the euthanasia of people suffering from Alzheimer’s disease and other forms of dementia, people with chronic but not terminal illnesses, people of all ages with disabilities, elderly people with various health issues, and those deemed not competent to manage their own health care. I also found myself confused. On one hand, we have organizations such as Do It for Daron, health centres such as The Royal, and countless individuals striving to prevent suicides and to teach us to recognize the warning signs so we can encourage others to seek help. We hear about the need for a national suicide prevention strategy. And on the other hand, the Supreme Court has ruled the federal government has one year to enact a new law that doesn’t unfairly restrict access to doctor-assisted death. Once we have embraced the idea of suicide, not as a tragedy we should seek to prevent, but a right we are obliged to uphold; once the taking of life has been converted from a crime into a service—“physician-assisted death”—to be performed at public expense. . .how is it to be imagined that we could stop there? Some readers may think I’m borrowing trouble, but a look at past posts on Action Life’s blog or LifeSiteNews gives us a frightening glimpse of just how the legalization of assisted suicide has played out in Belgium and the Netherlands. Often we talk about groups in armed conflicts having little value for life, but in a country where “abortion rights” and “death with dignity” aren’t uncommon phrases and where the highest court in the land has struck down the laws on abortion and assisted suicide, I can only wonder whether others would view our country as one that values life or holds it cheaply. May we continue to pray and work for the recognition of the right to life—and for the recognition that “assisted suicide” and “death with dignity” aren’t synonymous. Every human life, from the moment of conception until death, is sacred because the human person has been willed for its own sake in the image and likeness of the living and holy God. From the first moment of his existence, a human being must be recognized as having the rights of a person—among which is the inviolable right of every innocent being to life. At one time or another, most of us have been distracted in church by the sound of a baby testing her lungs or a toddler fussing when his parents want him to sit down. How can we promote respect for life? By participating in prayer vigils across from abortion clinics; supporting pro-life organizations and crisis pregnancy centres; working toward the enactment of legislation to restrict abortion; praying for and supporting those who choose the adoption option (birth parents and adoptive parents); and finding other positive ways to oppose abortion, such as by maintaining a pro-life bulletin board at our church. Today the Church in the United States marks the Day of Prayer for the Legal Protection of Unborn Children. Here in Canada, where no laws restrict abortion, may we also pray for these children and promote their right to life. As believers, how can we fail to see that abortion, euthanasia, and assisted suicide are a terrible rejection of God’s gift of life and love? 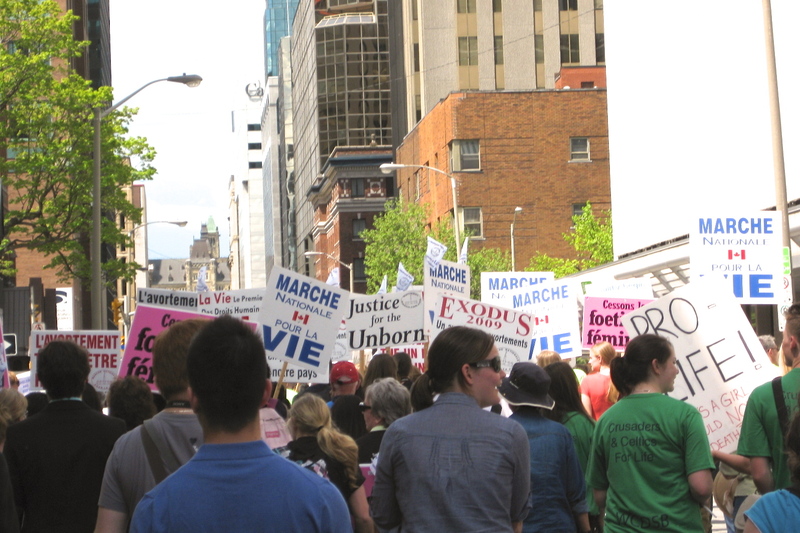 Recently, I had the chance to pray across the street from the Ottawa abortion clinic with people from my parish and another parish, as part of 40 Days for Life. We said the rosary, read aloud from the Gospels, and prayed as we walked along the sidewalk. I prayed for the fathers who would never know their children and the grandparents who wouldn’t get to hold their grandchildren. For the mothers who might come to regret aborting their children and would need healing. For the people working in abortion clinics, that they might have a change of heart, like Abby Johnson did. On a busy workday, I hope our quiet witness touched someone who passed by. But we can do more to witness to our belief in the sanctity of life. We can educate ourselves on life issues through websites such as those of Action Life, Campaign Life Coalition, the Euthanasia Prevention Coalition and LifeSite News. We can follow the progress of legislation and court cases touching on abortion, adoption, reproductive technologies, stem cell research, and euthanasia and contact our member of Parliament or member of provincial parliament to express our views. We can support crisis pregnancy centres and palliative care programs. We can encourage parents who choose to adopt children. And we can pray that more people would recognize that “Every human life, from the moment of conception until death, is sacred because the human person has been willed for its own sake in the image and likeness of the living and holy God” (s. 2319 of the Catechism). May we choose life and teach our children and youth to do the same. Every now and then, I’ve considered joining a political party. While I have no plans to run for political office, sometimes I think it would be good to have a say in a party’s policies. Today I learned that I’d better not look to the Liberal or New Democratic parties. With my pro-life views, I’d be completely unwelcome. According to an article in the Ottawa Citizen, “Liberal candidates must be pro-choice,” Liberal leader Justin Trudeau announced that people “must make concrete commitments to be openly pro-choice in their positions and if they want to be a candidate in 2015.” Ditto for new party members. I nearly choked on my breakfast. How often we have heard comments about the way Conservative MPs must toe the party line? And yet some Tory MPs have introduced pro-life private member’s bills and voted in line with their pro-life beliefs. It seems that, for the Liberals and NDP, just holding these beliefs is unacceptable. Surely these parties aren’t going out of their way to alienate people of faith and others who take a pro-life stance. Wouldn’t they want to encourage a wide range of Canadians to stand for public office? Perhaps those in power should take a look at Parliament Hill today as people gather from across Ontario and the Outaouais to take part in the National March for Life. And note the other marches being held in Victoria, Edmonton, Halifax and St. John’s today. And in Winnipeg on Saturday, Saskatoon on Sunday, and Fredericton next Thursday. Not to mention the one that happened in Regina on April 28th. Maybe they’d see that many Canadians believe life begins at conception. And recognize that their views should also be represented in the House of Commons. I loved Halloween as a child, both the trick-or-treating and costume creation. But my family didn’t really decorate for Halloween, and it isn’t my thing now. I won’t be transforming our front lawn into a graveyard. At Christmas, my decorations will be up for a month, but at Halloween, the window clings and other items tend to go up just a day or two in advance and come down early on November 1st. And I can’t say I’m keen on carving pumpkins either. Probably because the pulp feels slimy as I scoop it out. I’d honestly rather enjoy homemade pumpkin pie. But since it’s something my son and I do together, and my son’s braces mean all the good stuff is off-limits (no chewy or sticky candy or corn chips for him) and the thrill of trick-or-treating is gone, we’ll be carving a pumpkin in the next few days. Usually we brainstorm ideas while I create a lid and hollow out the pumpkin. The past couple of years, we’ve had a horror-film theme going. 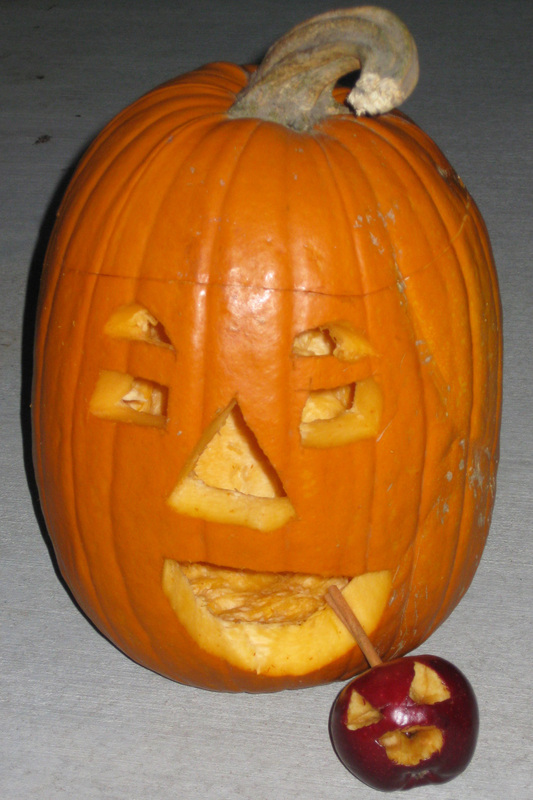 In 2011, our pumpkin “vomited” pumpkin pulp into a bowl. Last year, our pumpkin used an apple as a juice box (shades of the Calvin & Hobbes snowman comic strip where a snowman uses an ice cream scoop on another snowman). I know some Christians choose not to mark Halloween. But if you do find yourself carving a pumpkin, I’d like to suggest a wonderful idea I saw in the October issue of Catholic Digest: a pro-life pumpkin. On its website, the American Life League offers pro-life stencils for pumpkin carving, including a silhouette of a baby sucking his or her thumb. 40 Days For Life has succeeded in shutting down 39 abortion facilities, and has documented saving at least 7,536 babies. In addition to the babies, 83 abortion workers have quit their jobs and walked away from the abortion industry and thousands of women have been spared the suffering and trauma that comes with the decision to abort one’s own child. With the 40 Days for Life campaign drawing to a close in just over a week, I pray that we would show our support for life, whether by saying a rosary for life or peacefully witnessing to our pro-life beliefs in some way. Even if it’s as simple as using a pro-life pumpkin design.